We are all familiar with the game of Dominoes. In this board game one small piece can have a knock on effect. When one falls, scores of others can fall with it. Today many fear the little country of Greece may be such a domino. 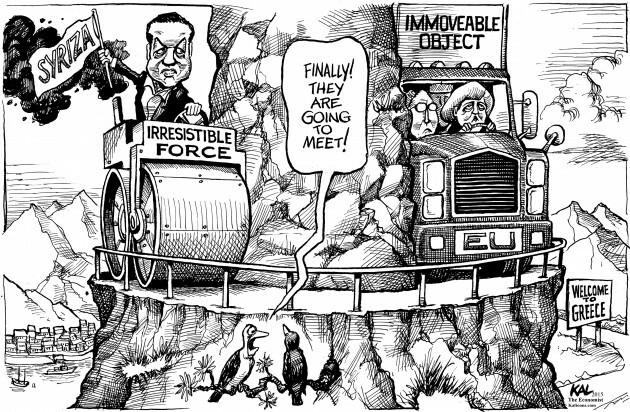 As Greece wobbles, so does the future of the European Union (EU). If it falters, there will be negative knock on effects throughout the region and for us here in the USA. Sitting atop the Greek domino is newly elected Prime Minister Alexis Tsipras of the newly formed SYRIZA party. A left wing polyglot of former Communists, socialists, independants and generally disaffected citizens, Syriza quickly rose to prominance during in that last two months with promises to reverse the crippling austerity measures imposed by EU lenders on the poor suffering Greeks. Tsipras won a land-slide victory in a Greek snap-election in late January ( though he only garnered 35% of the vote). Without skipping a beat, Tsipras appointed Athens University professor and Valve Corp. resident economist Yanis Varoufakis as the new Finance Minister of Greece. In time-honored Greek fashion, Varoufakis is happy to unabashedly voice his unpopular and radical positions to the world, undaunted by the number of those who oppose him. This week Varoufakis took his show on the road: He made a grand diplomatic tour of the Euro-zone to personally demand that the EU renegotiate the terms of Greece's €240 bailout. Unsurprisingly, Varoufakis returned to Athens without a single vote of confidence from another nation in the Union; even fellow left-leaning countries like France and Italy rejected the finance-firebrand's proposal. That seemed to matter little to the people of Greece, as citizens flooded the streets of the capital city to show their support of their new hero's defiance of the EU giants in Brussels and Berlin. To the Greeks, Varoufakis is the only man brave enough to challenge the authority of the world's most powerful woman, German Prime Minister Angela Merkel. With speculation now abuzz about the possibility of the rigid Merkel being brought to her knees, the German PM has asserted that the Greeks will not get away with reforming the terms of their debt. For Varoufakis, that assertion still remains to be seen. A head to head confrontation seems to be certain. It appears that before there is a game of dominoes in Europe there is going to be a game of "Chicken" between Greece and its European adversaries.